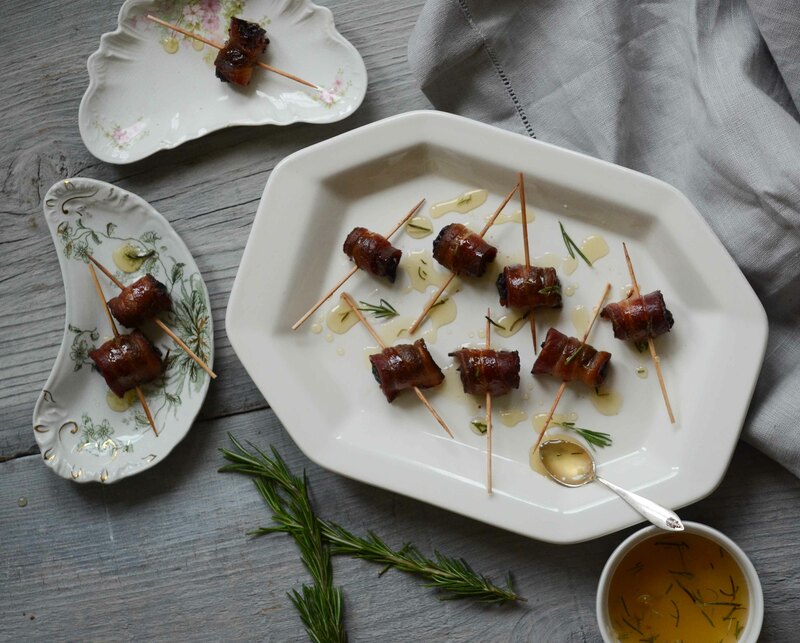 Bacon-Wrapped Dried Plums with Rosemary Honey (AIP, Paleo) and Slim Palate Cookbook Giveaway WINNER! First up: congratulations to Elaine Harbaugh Heffner for winning last week’s The Slim Palate Paleo Cookbook giveaway! Happy cooking to you, Elaine, I know that you’ll love it. 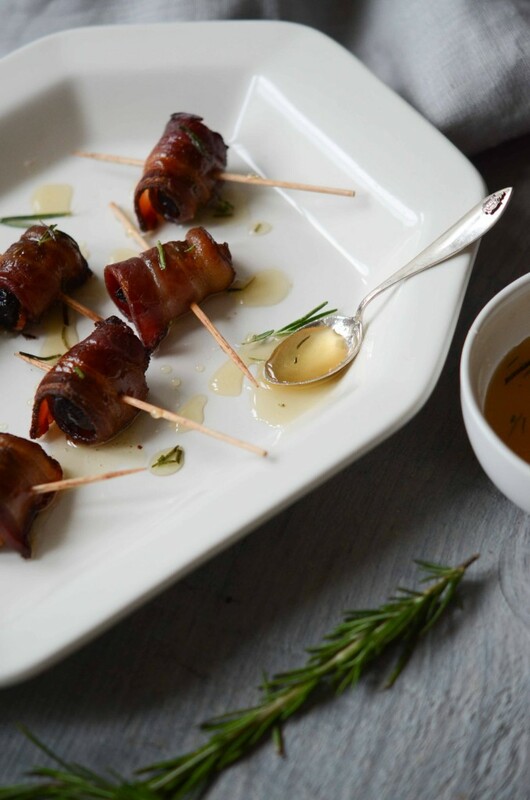 You’ll of course recognize these little tasties as a twist on Devil’s on Horseback (dates stuffed with blue cheese, wrapped in bacon; they’re marvelous). I started playing around with them because I wanted to avoid dairy AND I wanted to bring them as dessert to a party. Bacon for dessert – why not? The honey – in my mind, at least – is what transforms the dish from appetizer to dessert, although these would be perfect as an appetizer as well, or for dinner for that matter (seriously, serve with a salad alongside). I chose dried plums instead of dates to take the sweetness down a notch, and added rosemary to the honey to, you know, class up the joint a bit. Nothing elevates a humble prune like the fragrance of fresh rosemary. And a few grinds of black pepper, that’s nice too. All together, I like these better than the cheese stuffed version, and I think you might too. I ate them – and attended the party I brought them to – in celebration of completing the manuscript for Twin Cities Chef’s Table. Hooray! I was way over deadline, I hit about 20 walls while writing it, but it is done. What an incredible, life-altering experience. I had a blast photographing almost 60 chefs and their beautiful food! I credit sorting out my health via the autoimmune protocol (AIP) diet I’ve been following for the last three months and my friend Joy Summers (do not miss her delicious, hilarious dining and cocktail raves at TC Taste/Minnesota Monthly, The Heavy Table, Thrillist, or her blog, Eating the Minneapple) for getting me past the writing wall I hit a few months ago. As much as I loved the work, I was sick, exhausted, and struggling mightily. I leaned on Joy for her in-depth knowledge, exactly the shot of perspective and creativity I needed to finish many of the restaurant introductions. What a gift it is to have such a talented, generous friend! And now? Full steam ahead on Fresh Tart. Look for more and more fresh, seasonal AIP and paleo recipes. Good health is the name of the game, but deprivation is not. It’s summer! Beautiful food abounds and I’m so excited to share some of the dishes I’ve been making and enjoying with you all. My son graduates from high school on Friday, the book is done, my health is back on track…I’m officially declaring a new chapter in my life and I’m so grateful to be sharing this journey with you. Preheat oven to 400 degrees F. Line a baking sheet with parchment paper. 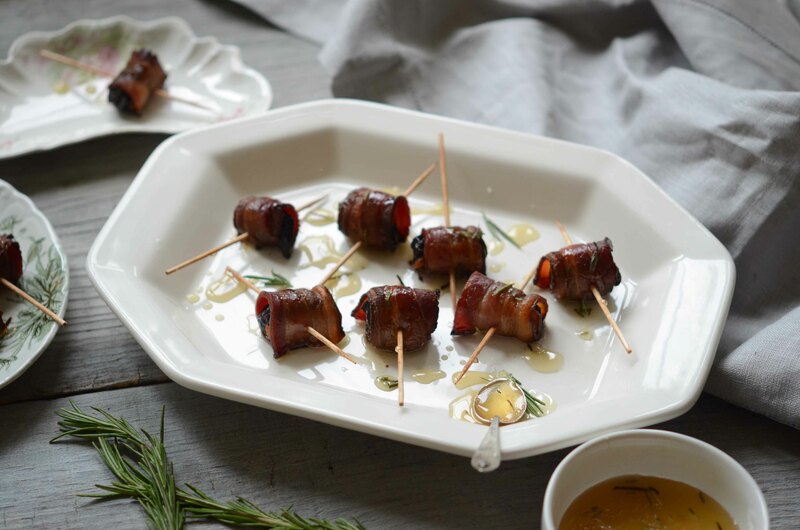 Wrap each plum in bacon slice and secure with a toothpick, setting on baking sheet as you go. Bake plums for 20-30 minutes, until bacon is nicely crispy. Transfer hot plums to a serving platter. Heat honey and rosemary in a small saucepan over medium heat until warm and runny. Drizzle honey over plums. Serve warm. « Scallops with Morels, Ramps & Saffron-Coconut Milk Pan Sauce (AIP, Paleo) plus The Slim Palate Paleo Cookbook Giveaway!